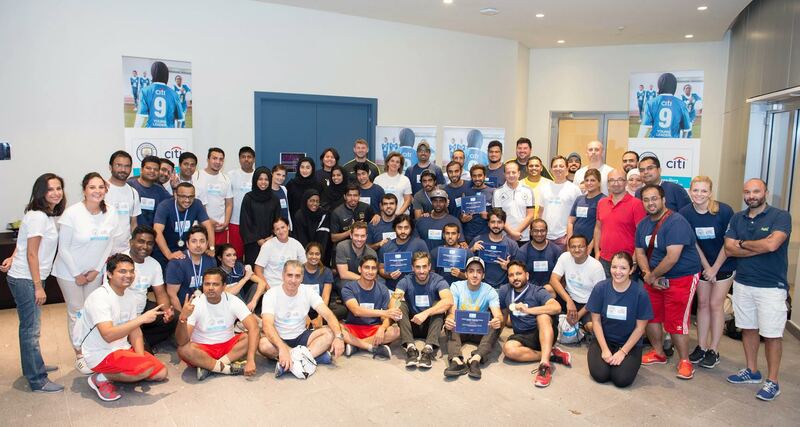 Manchester City Football Club in partnership with Citibank UAE and Emirates Foundation Kafa’at Program hosted a two-day community football coaching and leadership workshop for aspiring sports leaders at New York University Abu Dhabi on October 21 and 22, 2016. The Cityzens Giving Young Leader training forms part of Manchester City Football Club’s Cityzens Giving initiative, which supports young leaders around the world to tackle pressing social problems through the power of football. “Citi is proud to partner with Manchester City Football Club and Emirates Foundation Kafa’at Program to host this workshop to unlock new opportunities for aspiring sports leaders in the UAE,” said Elissar Farah Antonios, Chief Executive Officer of Citi UAE. “At Citi we are committed to promoting a culture of health through our Live Well at Citi program and believe that maintaining a healthy lifestyle can enable the youth in the region reach their full potential,” she said. The training hosted close to 30 young Emiratis and focused on community football coaching with in class and on the pitch workshops on leadership, healthy living, life building skills, practical planning and using football as a tool to positively impact social issues. In 2015, Manchester City Football Club and Citi announced a new sponsorship that saw the English Premier League Club join forces with the leading global bank. Through this multi-year agreement, Citi became an official banking partner of Manchester City FC. Since its acquisition by the Abu Dhabi United Group in 2008, Manchester City has risen to become one of England’s most successful football clubs. Manchester City FC is an English Premier League club whose roots began in East Manchester in 1880 as St Mark’s West Gorton. It officially became Manchester City FC in 1894 and has since then gone onto win the European Cup Winners’ Cup, four League Championship titles, including two Premier League titles, and five FA Cups. Manchester City FC is one of four teams comprising the City Football Group and counts New York City FC, Melbourne City FC and Yokohama F-Marinos among its sister clubs. Under manager Pep Guardiola, one of the most highly decorated managers in world football, the Club plays its domestic and Champions’ League home fixtures at the Etihad Stadium, a spectacular 55,000 seat arena that City have called home since 2003. Today, the Stadium sits on the wider Etihad Campus, which also encompasses the City Football Academy, a world-leading first team training and youth development facility located in the heart of East Manchester. Featuring a 7,000 capacity Academy Stadium, the City Football Academy is also where Manchester City Women’s Football Club and the Elite Development Squad train on a daily basis and play their competitive home games. Cityzens Giving supports young leaders in cities around the world to tackle tough challenges affecting their communities, through the power of football. Every year, City Football Group and its partners donate funds to community football projects around the world and the fans of Manchester City FC, New York City FC and Melbourne City FC decide how funds are split by choosing the project that inspires them the most. Cityzens Giving Young Leader Training is being delivered by coaches from Manchester City FC’s Foundation, City in the Community, and aims to develop young community leader’s communication and community football coaching skills to address issues such as HIV, gang crime and educational attainment.Cityzens Giving currently funds projects, run by young leaders in Manchester, New York, Melbourne, Kolkata, Cape Coast, São Paulo, Kuala Lumpur, Cape Town and Barranquilla. These projects have been created to tackle issues like unemployment, social inclusion and HIV / AIDS. Responding to market needs for more Emirati’s to join the private and semi-government sectors, “Kafa’at” program promotes positive career growth for youth through learning and development projects and enhances their workplace skills, competencies and compatibility. Established in 2007, the Kafa’at program is designed to enhance the potential of Emirati youth and prepare them to adapt effectively with the private and semi-government sectorial needs within a global economy. Provide youth with insights into the private and semi-government sectors. Build youth capacities through mentorship.